I am out of step with the season. Boston is finally (occasionally) gracing us with weather that doesn’t require a scarf, hat, gloves and leg warmers* to endure and I’m serving up beef stew. I have a two fold problem. The first is that I am running about a week behind on fulfilling my food cravings what with the old stove/new stove hiatus. So, the soup we had for Dinner last week was actually what I desperately wanted to eat the week before that, and the stew we’re having this week is something I’ve been craving since the middle of March. What we’re having next week has been on hold for even longer than that. The other half of my problem is that I’m going through a stage where everything seems appealing and there more food that I want to make than there are days in the week for me to serve it. That doesn’t even take into account all the restaurants I also want to try – like Oleana where there is literally only one thing on the menu that I don’t want to order (the tuna kibbeh if you’re curious). Nor does it allow for recipes that I want to make again because they were so tasty the first time around – like the Posole and the Indonesian Chicken. My delicious account is stacked with recipes I want to try, and there’s an actual stack of printed recipes on my desk at work that I want to make. I think I have Dinner mapped out for the next six weeks. This is great except that I want to make and eat these things now now now, not four weeks from now. Anticipation is lovely, but it’s also frustrating. My craving for beef stew started when a recipe for Pork & Guinness Hand Pies floated across my computer screen, and was then compounded by the deluge of pictures of beef pot pies that accompanied St. Patrick’s Day. In fact I spent quality time in the wake of St. Patrick’s Day staring at individual gratin dishes online and emailing Jes asking her to talk me out of buying a set of eight (which she totally didn’t because she’s a filthy filthy enabler). Let me pause for a moment to clarify. I did not in fact buy eight 6oz gratin dishes despite the fact that they were (a) on sale, (b) came in a range of bright cheerful colors, and (c) would have enabled me to serve individual beef pot pies for Dinner tonight. I would like recognition for my heroic act of restraint. Spending a week staring at gratin dishes and perusing beef pot pie recipes left me physically hungry for tender fall apart chunks of beef suspended in a rich unctuous sauce that would spill across my plate in glossy pornographic ways. So I created a spreadsheet (this you can mock) to compare eight or ten of the recipes for beef stew I saw that seemed appealing and tried to work out what the ordering principal was for the meat : liquid : thickener ratio. I was briefly frustrated when it became apparent that there really is no ordering principal for this ratio and then relaxed and embraced the magic that is beef stew. And here’s the thing, beef stew really is kind of magic. It is next to impossible to screw it up. It cannot be overcooked (I suppose you could undercook it, but more people worry about overcooking meat than undercooking it). It gets better if you abandon it in your fridge for a couple of days. And, most importantly, it can be tailored to suit whatever mood you’re in when you start cooking. Want to be transported to the French (or Italian) countryside? 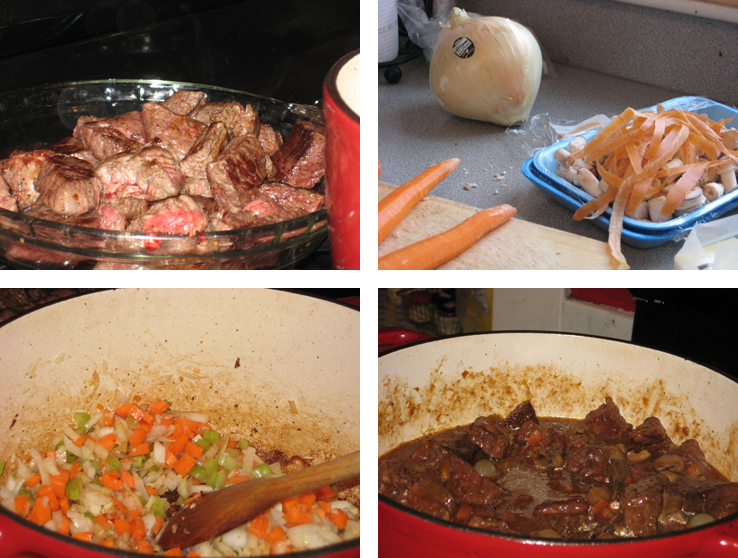 Use some red wine and beef broth (or leave out the beef broth entirely and create Boeuf Bourguinon). Want something more Anglo-Saxon? Use beer instead of wine. Looking for something a little more exotic? Substitute a can of diced tomatoes for some of the liquid, add a stick of cinnamon and some dried fruit, serve it over couscous and call it tagine. Want something that could unequivocally be described as soup? Skip the flour and add more liquid. Want something you could tuck inside a flaky pastry crust and bake into a hand held delight? Use more flour and less liquid. Or, and this is my personal preference, want something that leaves you staring at your bowl debating whether a fork or a soup would be the most efficacious weapon for the decimation of your dinner? Add some flour at the beginning and then more later until you achieve your desired level of stewiness. If you’re like me you add mushrooms and pearl onions with a heavy hand and skimp on the carrots. But, you could also leave the mushrooms out entirely and add in disks of carrots and cubes of potatoes (or sweet potatoes would be good too). You could use leeks instead of onions, or add parsnips if you like that sort of thing. You could even add green beans if you were the sort of person who didn’t loathe green beans in stews (unlike say, me). You could leave out the vegetables all together and add a lot more onions and you’d have Carbonnade. The recipe below is really just a base that you can manipulate anyway you like depending on your whimsy and the contents of your fridge. * Don’t mock, that was the best $13 I spent this winter. Melt a little butter in a large stew pot and then saute the mushrooms until lightly browned. Remove to a small bowl and reserve. Pat your meat dry and season with salt and pepper. Add a little vegetable oil to the stew pot and then brown your meat in batches, adding more oil as necessary. Remove to a bowl (not the one with the mushrooms). Be careful not to crowd your pan when you do this or the meat will just kind of steam. You can dredge your meat in flour before you brown it, and let that flour thicken the sauce. However, I find when I’m browning multiple batches of meat that the flour ends up burning on the bottom of the pan and giving the stew a faint muddy flavor so I prefer to add the flour later. Add a little more vegetable oil to the pan if necessary and then sauté the carrots, celery, onion and garlic until softened, scraping up the fond that has developed on the bottom of the pan. Deglaze the pan with the calvados and use it to scrape up any fond that might still be lurking. Cook until almost all the liquid has evaporated. Add the tomato paste and cook, stirring constantly, for a minute or so. Sprinkle the flour over the vegetables/tomato paste mixture and stir to combine. Cook, stirring constantly, for a minute or so. Add the beef broth, Guinness, orange zest and thyme. Stir to combine everything. Return the meat to the pan and bring to boil. Partially cover and simmer for 1.5-2 hours. Remove the pan from the heat and add the mushrooms back to the pot and stir in the (still frozen) pearl onions*. Allow to cool to room temperature and then refrigerate for 1-2 days. Skim any solidified fat from the surface of the stew and reheat over a low flame. Season to taste with salt and pepper and thicken more if necessary. A few minutes before you plan to serve stir in the (still frozen) peas and cook for 1-2 minutes until they are heated through. To thicken the stew take a ladle or so of liquid from the pot and place it in a small bowl. Whisk in 1-2 Tbsp (or more depending on how thick you’d like the stew to be) of flour. Make sure the slurry is completely smooth and then stir that back into the stew and allow to cook for 5-10 minutes to thicken the stew. If you try and add the flour directly to the stew you’re likely to end up with flour lumps, creating the slurry prevents that. * If you want you don’t have to wait 1-2 days to eat your stew, and given how distractingly good your house will smell at this point I will understand if you do not have the fortitude to wait that long, don’t remove the stew from the heat when you add your mushrooms and onions. Cook the mushrooms and onions with the stew for 10-15 minutes, or until the onions are tender and heated through and then proceed with the recipe as if you’d stashed it in the fridge over night. I resisted the siren call of individual gratin dishes, allow me to be a little fanciful in the presentation. Whisk the egg with a little water to create an egg wash.
Lightly flour your counter and unfold one sheet of puff pastry on to it. Lightly press the seams together and then roll out to a 9 x 12 (approx) rectangle. 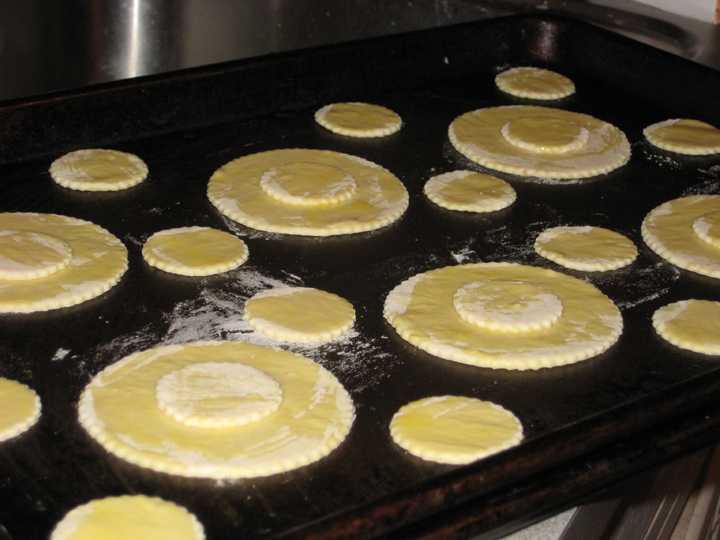 Cut out enough large rounds with a biscuit cutter so that each person you’re serving will have one round each. Place on a baking sheet. Lightly dock the centers of each round with a fork and then brush with egg wash. 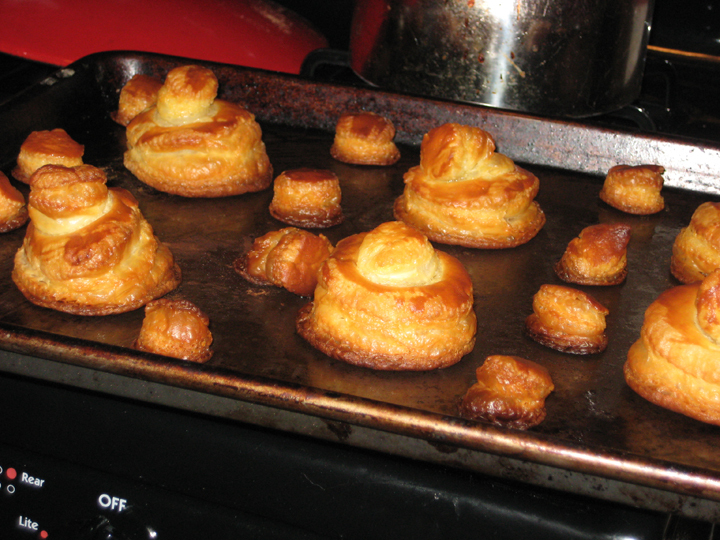 Roll out the second sheet of puff pastry as above and cut out an equal number of smaller rounds. Place each smaller round in the middle of a larger round (you’re making top hats, get it?) and brush with some of the egg wash.
Cut as many more rounds from the remaining puff pastry as you can and brush with egg wash and place on a baking sheet, there’s no sense in wasting the puff pastry. Bake according to the directions on the packet. Serve each bowl of stew with a rakishly tilted top hat. * You could be industrious and virtuous and make your own, or you could just buy it. Unless you’re competing on Top Chef nobody’s going to notice. I am so sad I was not at Dinner last night. 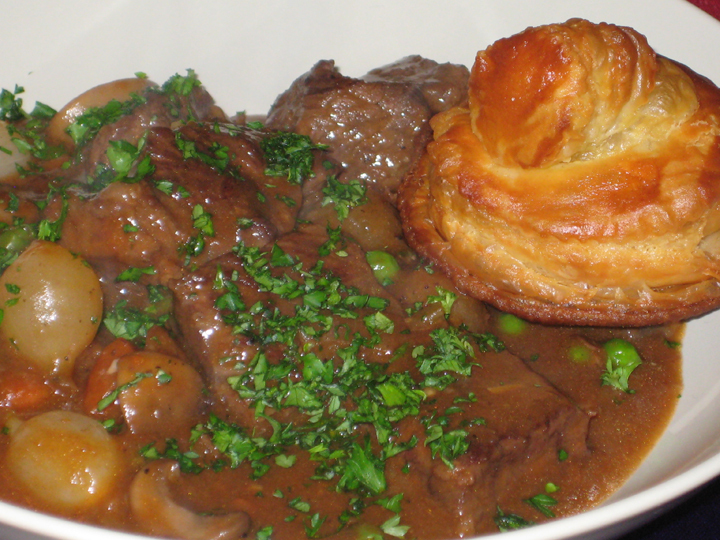 Beef stew and puff pastry (even if you didn’t make it yourself).